A straight, beautiful smile exudes confidence. If you or your child has crooked or crowded teeth, traditional braces represent one of the best, time-tested forms of orthodontics available. Our dentists here at Narre Warren Dental Care, have completed training through Progressive Orthodontic Seminars (POS) so they have the knowledge and expertise to provide exceptional orthodontic care. 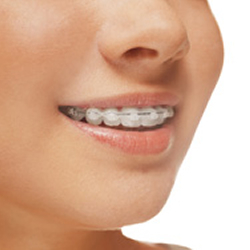 Not only are conventional metal braces the most commonly chosen orthodontic method, especially among teens, but they are also usually the most reasonable. And unlike the heavier and more cumbersome braces of the past, today’s metal braces are much lighter in weight and structure, making them more comfortable than ever! Your dentist will bond stainless-steel brackets to your teeth using a type of cement. The brackets are then linked together using a thin wire. The wire connects to each tooth bracket using o-rings or ligatures, which look like small elastics. We offer the o-rings in a variety of colours allowing you to choose the hue you’d like each month. You could select your favourite sports team colours for example. How Long Do I Need to Wear Them? Most people wear traditional braces for one to three years to allow their teeth to shift into their ideal positions. We will provide you with a retainer at the end of your treatment to help you avoid orthodontic relapse. After all, you will want to protect your investment. Wondering if traditional braces are right for you or your child? Contact our practice today to book a complimentary consultation!